Have you ever been really nervous for a test, a big game or a presentation at work? You’re not the only one. That nervousness you felt is performance anxiety – and medical professionals and students can feel it too. “In short, we’re combining psychology and education with nursing in hopes of improving how our students learn, and in turn improving how they treat patients in practice,” Holland said. Studies show that if this anxiety gets too high, it can hinder a person’s ability to perform skills at an effective level. Remember the last test you took? Did you panic? If so, chances are that panicked feeling may have caused you to miss a question or two. 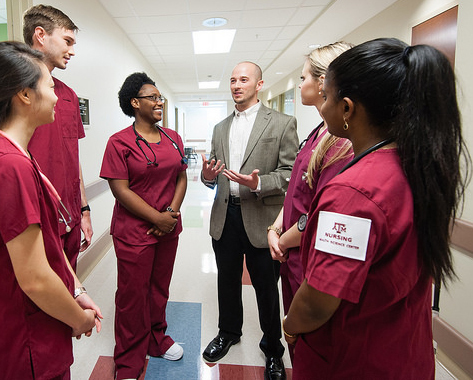 The Texas A&M Health Science Center College of Nursing is looking at ways to combat performance anxiety and ensure that medical professionals and students perform their skills at the highest level possible. In a series of research studies, College of Nursing faculty members have teamed together to find out what can be done for nursing students to be at their best for optimal learning and performance. Angela Mountain, M.S., RN, CMSRN, clinical assistant professor; Brian Holland, Ph.D., M.S.N., RN, CCRN, assistant professor; Sara Williamson, B.S.N., RN, Clinical Teaching Coordinator; and Kevin Gosselin, Ph.D., M.Ed., M.S., associate professor and assistant dean for research and evidence based practice, examined performance psychological applications within the simulation experiences of the Texas A&M Health Science Center’s Clinical Learning Resource Center where health professions students learn and practice their skills with simulated patients. “Previous studies have shown that many students experience high levels of anxiety that can interfere with learning and performance, which is completely contradictive to our goal of creating the best nurses, so we’re trying to help students find ways to control their anxiety levels,” Mountain said. The goal was to find the best way to prepare students to learn and perform in their optimal performance zone. “This does two things: ensures that students can learn more information at a more effective level, and that they can perform to their best possible abilities,” Williamson explained. Assigned musical therapy, autogenic training, movement meditation and self-selected music therapy were all examined in this series of studies. These techniques are commonly used to reduce anxiety in the field of performance psychology. While these therapies have been applied to other fields, they have not been applied in nursing. Nursing’s unique holistic approach to patient treatment relies heavily on interpersonal relationships, which can be greatly influenced by performance anxiety. The study, which is in its final phase, has shown that subjects’ anxiety levels are indicative of confidence and higher learning and performance. So how exactly does this all work? Gosselin explained that anxiety is characterized by two different types of symptoms: cognitive (mental) and physical. The cognitive symptoms were measured through subject surveys before and after therapy, while physical symptoms were measured by changes in blood pressure and heart rate. In both cases, the goal of the study was to find how to find the optimal level of anxiety prior to learning or performance evaluations. The various therapies being studied could be self-induced in practical application, which means that in the future, students and professionals can use these techniques themselves. While the findings are still being collected and compared to see which therapy is the most effective, the College of Nursing is finding positive results so far. The team explained that an optimal performance zone exists with performance anxiety. Basically, too little or too much anxiety can hinder learning and performance, so they’re searching for that zone that offers the best level of anxiety that will create an atmosphere that promotes confidence. Gosselin explained that this study is part of the College of Nursing’s larger goal of innovating health care education for all medical professionals.